Based on the New York Times bestseller by R.J. Palacio, “Wonder” tells the inspiring and heartwarming story of 10-year old August Pullman. Born with facial differences that, up until now, have prevented him from going to a mainstream school, Auggie becomes the most unlikely of heroes when he enters the local fifth grade. As his family, his new classmates, and the larger community all struggle to find their compassion and acceptance, Auggie's extraordinary journey will unite them all and prove you can't blend in when you were born to stand out. 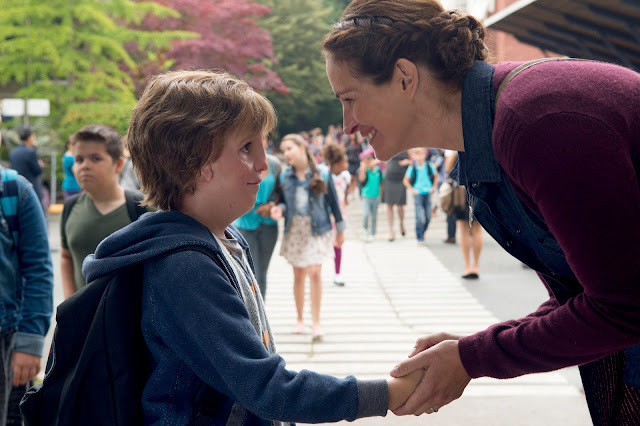 Golden Globe nominee Jacob Tremblay (Room) tackles the one-of-a-kind role of Auggie Pullman, whose birth defects and multiple surgeries have kept him out of school -- until now. Jettisoned into what is for him the brave new world of the 5th grade, Auggie steps into an unexpected journey. All Auggie ever wanted was to be an ordinary kid, but as his sister keeps telling him, you can’t be ordinary when you were born to stand out. Though he once found solace inside a space helmet, suddenly he must face a whole universe of gawking kids who don’t yet know how to face him back. Now, in a year by turns funny, tough and beautiful -- Auggie and all around him are transformed by the things that count most: friendship, courage and the everyday choice to be kind to everyone in your path.